Facebook Connect came out of beta today with a new brand – Instant Personalization – and, in typical Facebook form, the default is to share as much of your information as conceivably legal. By default, Facebook Connect will now share your real name, location, gender, friends list, “liked” pages and all other “public information” with any partner website you visit. If you do not want Facebook to share this information with any random site you visit, you’ll have to turn off Instant Personalization. 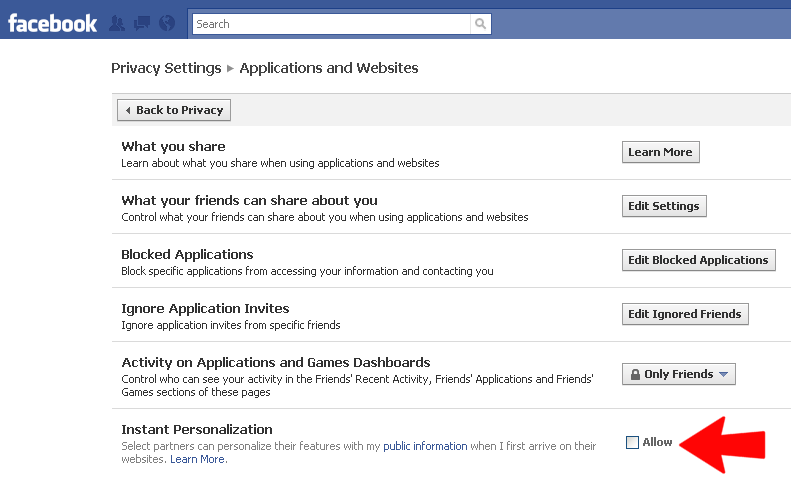 Out Go to Privacy Settings and then the Applications and Websites submenu. At the bottom of the page is Instant Personalization with a check box. De-select the box. Is that it? Does the opt-out work? UPDATE: The EFF has a new post up — How to Opt Out of Facebook’s Instant Personalization — which also instructs you to go to the Facebook pages for Microsoft Docs, Pandora and Yelp, and click “Block Application” on each one. New video here. Having gone through these steps, Facebook reserves the right to allow your friends to share things which you haven’t told them should not be shared. 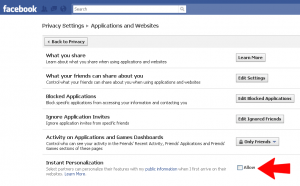 To stop that vaguely recalled acquaintance from high school from sharing everything on your page, you’ll have to go to this page and boxes. Facebook Connect isn’t as reliable out here on the advertising-free fringe of the net as it will be on the big advertising-driven portals and mega-sites. You may have to log-in here for it to work on my little site, but that’s a switch Facebook is obviously willing to flip for you if someone writes them a check with enough digits. I don’t pay to participate in Facebook’s developer pool and I don’t have a profit motive to convert an anonymous site visit into a legal name which I can cross reference with a phone book. Once Instant Personalization authenticates your session, it’s technically possible to watch you arrive on this page, find your phone number, call you up, greet you by name and offer to sell you a fraud insurance to protect your credit rating. Come on now: if you’re reading about your privacy, you’re clearly paranoid, right? You’re part of a target market which has been defined by the content you consume, and Facebook Connect can turn site hits into qualified (real-time) sales leads. That’s not how I earn my bread these days, but people do. Look, we all knew that Facebook wasn’t a retail platform like eBay and most of us figured out that they were going to make money off advertising. Precious few were those who saw the early days and thought “Dallas Smythe“. Advertising is about selling audiences to marketers and we, as individuals, are the product being sold by commercial portals and social networking sites. I’m not going to get any deeper into the theory of the audience-commodity here and now, but if you enjoy thinking about new media, that’s one for the quiver and you’ve got the keywords. I like to be able to to read anonymously. I like the fact that I can pay cash for a book and don’t have to show ID to buy a newspaper. I believe that the Internet was one of the freest, most decentralized and radically democratic communication mediums in human history. I think that was a good thing, and I’m annoyed that greedheads have been working so hard to enclose the digital commons. After two decades of fear-mongering, monopolistic manipulations, duplicitous avarice and rank whig history, it’s pretty clear that they will not stop until they own and tag every photon we absorb. Well, that’s fine. The RIAA tried to monopolize the distribution of music, and we all know how well that’s worked out so far. What’s going push back against document checkpoints on the information highway? I dunno. Probably some distributed, peer-to-peer, open source application born of the unholy love of anarchy, BitTorrent, SMS and FIDONET. Now, I’m not about to code that monstrosity myself, but I am going to see how well Andrea Belvedere’s Private Network can scale to my own social network (you too?). « "citizenship is not a birthright"